Alright… go outside, and take a giant deep breathe in through your nose…. What does it smell like? If you’re in a similar situation, it’s starting to smell like a cool fall day, with a gentle breeze and no humidity. Don’t get me wrong, I love summertime, it’s beautiful out, the sun is shining for over 12 hours of the day, but man does the humidity just make it horrible! I have long, thick hair, and the humidity and my hair don’t play nice, it ends up being frizzy, wavy, and I just sweat. No one needs to see that. 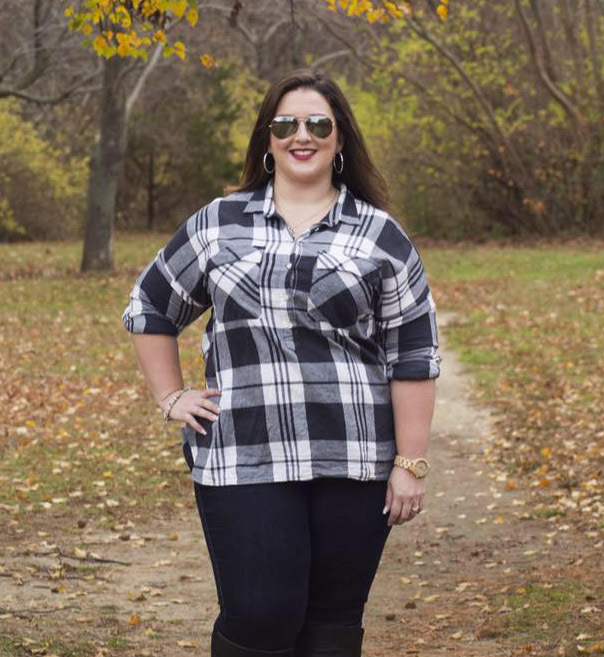 So the fall is great for my hair to be nicely done (without the possibility of looking horrible the moment I step out the door), and for all of the fun fall activities! 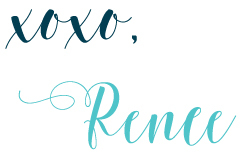 Our fall schedule is filling up quickly, with a wedding (we have one this weekend), my Birthday (next week! ), family & friends birthdays, and all of the fall activities we can do before it gets too cold out. One of my favorite fall things to do is to have a fire, and just sit around, relax, talk, and make S’mores! I need to know, am I the only one who LOVES their marshmallows burnt to a crisp, ya know what I’m talking about, where the marshmallow is on fire, and it’s really super burnt? I can’t be the only one, CA looks at me like I’m crazy, but oh my gosh it’s the best! We love Fall, I feel like New York really does fall well, especially when we’re so close to Westchester and upstate, to really soak in the fall foliage. We did that last year with a walk over the Hudson, and the lines of trees made it so picturesque, you could “feel” fall all around you. I sound insane, don’t I? Don’t answer that ;). We also love going out to the wineries, Pumpkin Picking, Vegetable Picking, and just being outside as much as possible. Being outside also means not being home a lot, even this past weekend we were out of the house at 9:15 and didn’t arrive home until almost 1 pm. We usually grab a snack or two when we’re going to be gone for a few hours just so neither of us gets hangry. I like variety in my snacks, I tend to get bored of the same snacks every day. Which is why I love love love cereal bars, even with the slight mess I can create making them. I am not the food shopper in my house but I recently went to Shop-Rite and saw Honey Maid S’mores cereal. It’s made with chocolate cereal puffs, mini marshmallows, and HONEY MAID® Graham Crackers. It’s a perfect combination of the deliciousness of S’mores for your morning start. CA loves anything that has a sweet flavor, so I knew bringing this home would be a no-brainer for both of us to enjoy. I also knew bringing an extra box home was a great idea, I’ve wanted to make cereal bars but needed the right cereal to create something delicious. And, I finally found it with Honey Maid S’mores cereal. In a large pot melt butter over low heat. Stir in marshmallows until completely melted. Remove from heat. Use a buttered spatula to stir in Honey Maid S'mores cereal until fully coated. Press cereal mixture into a parchment paper lined 9x13 inch pan. With a double boiler melt semi-sweet chocolate (if too thick add in milk 1 tbs at a time); remove from heat. Using a spoon, drizzle melted chocolate over the cereal bars until desired look is achieved. Freeze for 2 hours, after removing from freezer. Lift the cereal + parchment paper from the dish and lay on cutting board. Using a large kitchen knife, rock the knife until cut all the way through to the bottom, creating cereal bar squares. Depending on when you'd like to eat the bars, you may stick them in the freezer in sandwich bags, or in the refrigerator. I like keeping mine in the freezer and letting them thaw for about 30 minutes before enjoying. They are less sticky this way but still easy to enjoy! Whether you need a new snack to spice up your taste buds or just want something to munch on while you’re doing fall things, you’ll want to have a box of Honey Maid S’mores cereal on hand. It’s a delicious breakfast but can also make delicious cereal bars that will disappear from your fridge before you know it. 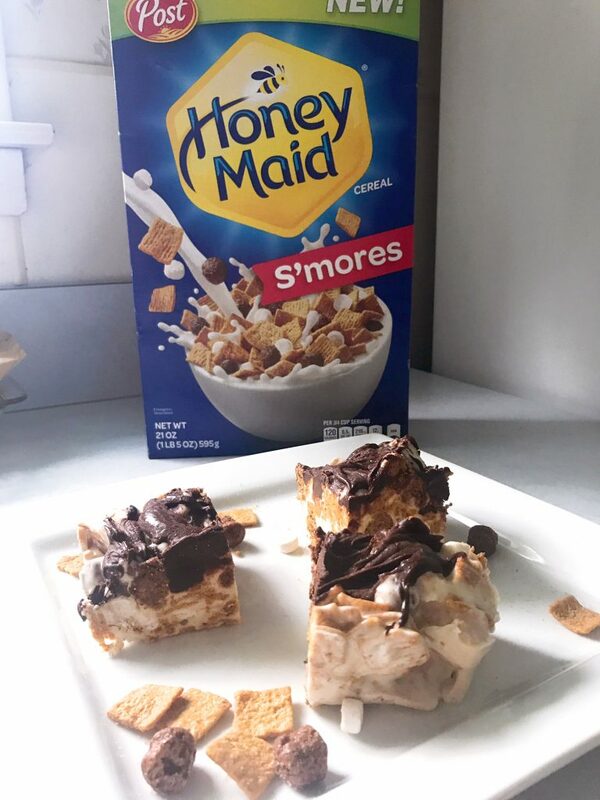 You can now enjoy the taste of S’mores wherever you are, look for Honey Maid S’mores where cereal is sold in Shop-Rite. Have you tried the Honey Maid S’mores cereal yet?